Looking for a sedan that’s sporty yet efficient, comfortable, and high-tech? You’re in the right place! Both the Volkswagen Passat and the Ford Fusion offer a healthy lineup of incredible features and capabilities. So, how will shoppers in Irving, Grand Prairie, Grapevine, and Dallas choose between them? We at Metro Volkswagen hope to help you make this exciting decision with this vehicle comparison. Read ahead to see which model comes out on top when it comes to performance, interior comfort, and technology! On top of the incredible fuel economy you’ll get with the Volkswagen Passat, you’ll also get plenty of excitement with its available DSG® transmission. This transmission lets you shift faster and more smoothly. With the Ford Fusion, you’ll also have more than one engine to choose from. However, you won’t have a high-tech transmission and you won’t get close to the great fuel economy that the VW Passat has to offer, no matter which non-hybrid engine you choose. The Volkswagen Passat isn’t just peppy and efficient. This model also specializes in making each of its five passengers comfortable, no matter how long they’re in the car. The VW Passat sports 39.1 roomy inches of rear legroom as well as standard 8-way power-adjustable front seats. The Ford Fusion, on the other hand, offers just 38.3 inches of rear legroom. So, if you’re a bit taller than average, you’ll be squeezing into the back seat. Additionally, the Fusion only standardly offers a 6-way manual-adjustable driver’s seat and 4-way manual-adjustable front passenger seat. You also won’t have lumbar support in these two front seats unless you upgrade to a higher trim level. On top of being spacious and comfortable, the interior of the Volkswagen Passat is also tech-savvy. 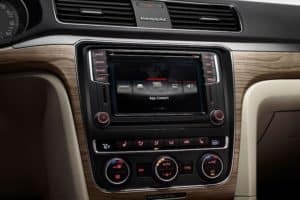 Every trim level of the VW Passat offers an infotainment system with a screen. With this screen, you’ll be able to follow turn-by-turn navigation, check sports scores, get live weather updates, and much more thanks to the included SiriusXM® Traffic and Travel Link® features. This model also offers a handful of ways to stay connected. Make hands-free phone calls and wirelessly stream music with standard Bluetooth®. Or, check in with your favorite apps right on the infotainment screen via Apple CarPlay™ and Android Auto™. Unfortunately, the Ford Fusion doesn’t offer an infotainment with a screen in every trim level. This makes it impossible to take advantage of helpful features, such as navigation and smartphone app integration. 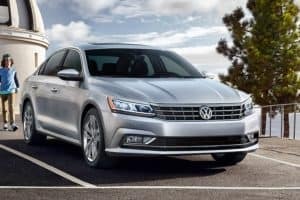 Volkswagen Passat vs Ford Fusion: Which One? As you can see, the Volkswagen Passat is the clear choice for sedan shoppers in Irving, Grand Prairie, Grapevine, and Dallas. Now, it’s time to get behind the wheel and get the full experience for yourself. 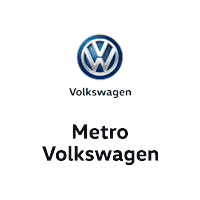 Schedule your test drive today by giving us a call at Metro Volkswagen! 1 25 city/36 highway mpg (2018 Passat 2.0L, 6-speed automatic transmission). EPA estimates. Your mileage will vary and depends on several factors, including your driving habits and vehicle condition.